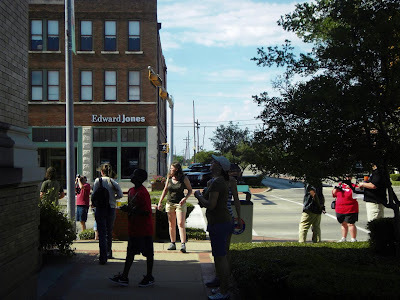 We had 28 shooters turn out for the photo walk in Terrell yesterday. It was fun, and turned out a lot better than I had imagined. We walked down Moore Ave. and then went over to the Griffith homeplace. I met some great photographers and got a lot of tips. I will share my favorite photos over the next few days. I took more of the other shooters than of Terrell. The Terrell Photo Walk was one of 900 Scott Kelby's second annual worldwide photo walks that took place yesterday. 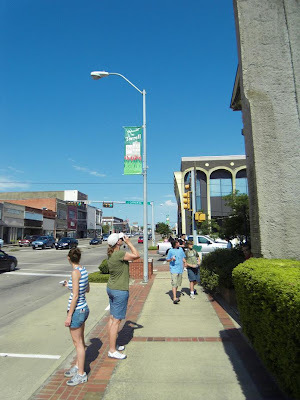 Visit the Terrell Photo Walk Flickr page for some great shots of Terrell by some awesome photographers. I would guess we had half people from Terrell and half visitors. We had some kids on the walk working on a Boy Scout badge, which was pretty neat. These shots were taken on the corner of Moore Ave. and Catherine at the old 1st National Bank building. I want to thank the City of Terrell Marketing Director Lynnette Nadeau, Susan Roberts, who hosted us Saturday morning and Davis Griffith-Cox, who opened up the grounds to the Griffith family homeplace. I look forward to the 2010 walk.